“Scorched” by Wajdi Mouawad, translated by Linda Gaboriau, produced by A.C.T. Director: Carey Perloff. Scenery: Scott Bradley. Costumes: Sandra Woodall. Lighting: Russell H. Champa. Sound: Jake Rodriguez. Projection Design: Alexander V. Nichols. Dramaturg: Beatrice Basso. Assistant Director: Emily Hoffman. Alhonse Lebel/Doctor: David Strathairn. Simon/Guide: Babak Tafti. Janine: Annie Purcell. Ralph/Antoine/Militiaman/Photographer: Manoel Felciano. Nawal at 14-40: Marjan Neshat. Wahab/Nihad: Nick Gabriel. Jihane/Nawal at 60/Adessamad: Jacqueline Antaramian. Nazira/Janitor/Malak/Chamseddine: Apollo Dukakis. Elhame/Sawda: Omozé Idehenre. Writing out of a difficult personal past, Mouawad has written a difficult and personal play. It explores the family past of two Canadian twins, children of a recently-deceased Middle Eastern mother who never spoke to them of her youth and from whom they have been estranged. In the course of the play, we learn how she was effected by war and torture and unspeakable terror and the secrets of the family’s past. Unfolding like a dream, the play holds echoes of Greek tragedy in its elegant shell, as well as suggesting critical commentary upon the very nature of war and suffering. As in a dream, the story is never one hundred percent clear. The audience is compelled to struggle with this material with the same confusion as it must have been lived. One is at times disoriented yet still deeply moved with tears, laughter and horror. Mouawad demands a lot of his audience; one must accept uncertainty and contradiction to attain the eventual reward of a profound emotional release—a true catharsis. Clearly, this company has taken the play deeply to heart and presented it with unusual personal commitment. It is an ambitious undertaking. The acting is excellent throughout, but special note must be made of David Strathairn‘s excellent performance as Alphonse Lebel, the notary public who was a friend of the twins’ late mother, cares about her secret history, and guides the young people in their excavation of the past. He does so while providing delightful comic relief with an endless litany of malapropisms. It is a lovely bit of theatrical fun, nicely balancing the seriousness of the drama. With Scorched, A.C.T. makes a strong claim to the front rank of creative experimentation in San Francisco, introducing a major world playwright to the Bay Area in a memorable and moving production. Highly recommended. Scorched continues through March 11, 2012. For further information, click here. 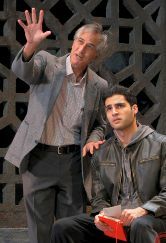 Posted in Reviews.Tagged A.C.T., Alexander V. Nichols, Annie Purcell, Apollo Dukakis, Babak Tafti, Beatrice Basso, Carey Perloff, David Strathairn, Emily Hoffman, Jacqueline Antaramian, Jake Rodriguez, Linda Gaboriau, Manoel Felciano, Marjan Neshat, Nick Gabriel, Omozé, Russell H. Champa, Sandra Woodall, Scorched, Scott Bradley, Wajdi Mouawad.